Screen-shot from one of the puzzles included in the block game. 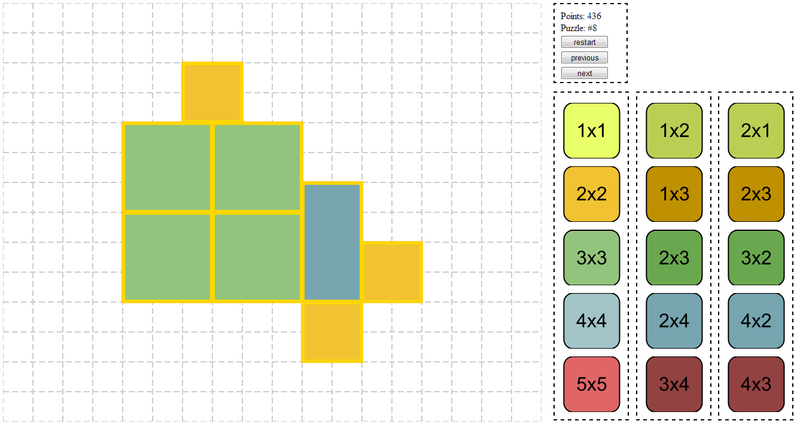 I wrote this puzzle/game last year with the hope it could be used to help generate some thinking about area, multiplication, and addition. Here are some questions you could use with the game. Try solving the problems, if possible, in a variety of different ways. Which ways give you the most points? How much is each piece worth? What is a general strategy you can use to get as many points as possible? How do you know your general strategy is effective? Note: This game does not currently work in Internet Explorer.